Watershed Management Area 12 extends from Perth Amboy to Point Pleasant Beach. WMA 12 is comprised of an assemblage of coastal subwatersheds, all or a portion of which fall into 56 municipalities in the Raritan Bay and Atlantic Coastal drainage basins. Although the majority of impacted municipalities are in Monmouth County, several lie within the boundaries of Middlesex and Ocean Counties. The Area 12 Watershed Management Partnership is composed of representatives of local, county, state and federal governments: representatives of six Regional Subwatershed Management Councils (Bayshore, North Coast/Shrewsbury River, Navesink Valley, Mid-Coast, South Coast and the Manasquan Valley); representatives of lake commissions and other watershed management groups; representatives of water purveyors; representatives of wastewater treatment authorities and facilities; representatives of military installations; representatives of the business community; representatives of the development community; representatives of environmental interest groups; representatives of the agricultural community; and of individual citizens, dedicated to enhancing and improving water quality throughout Watershed Management Area 12. 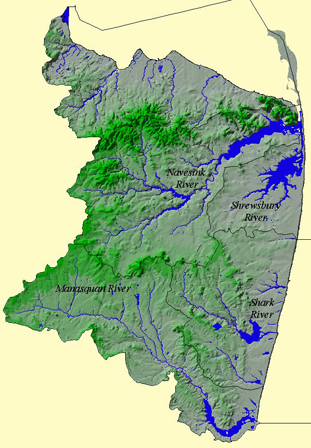 For more information regarding watershed management areas please contact DEP's Office of Policy Implementation and Watershed Restoration at (609) 633-2201.